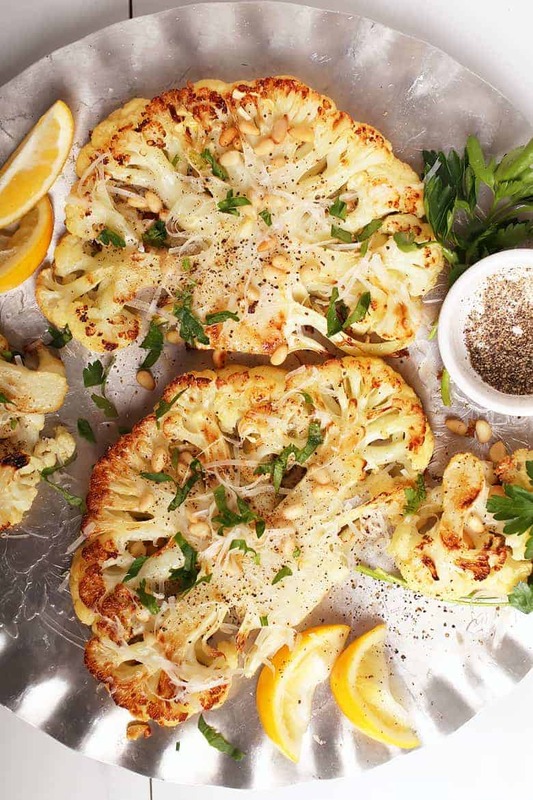 Impress all your friends with this vegan baked Lemon Pepper Cauliflower Steaks. A tender and creamy steak topped with fresh parsley, toasted pine nuts, and non-dairy parmesan cheese. Serve it with pasta or a giant salad for a delicious gluten-free and plant-based meal. Tomorrow is Valentine’s Day, my friends! What a crazy lovely day it is. While some of you may choose to go out on Valentine’s Day, I prefer to stay in. After years of working in restaurants and bakeries, I know the craziness of this holiday. From the service side of it, Valentine’s Day is not very fun. (In other words, be kind to your servers, leave large tips.) 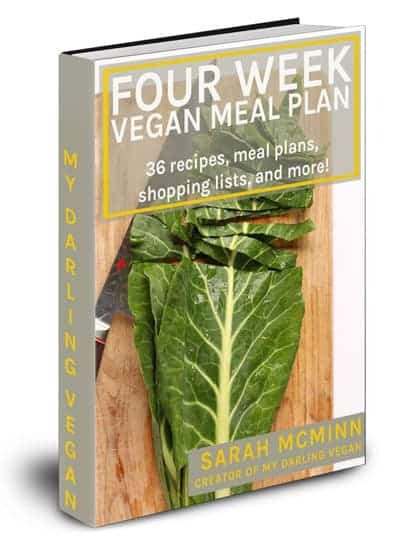 So I’ll be working on cooking a romantic vegan meal at home for this Valentine’s Day. 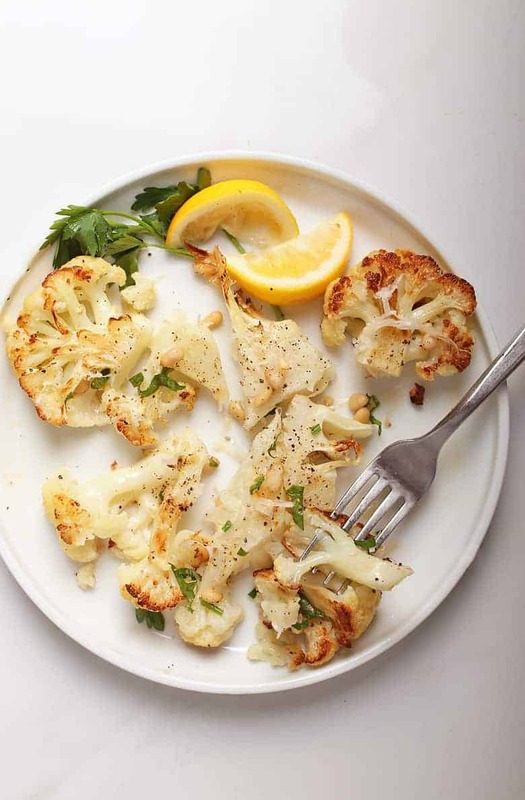 If you, like me, are opting to avoid the craziness that comes with the holiday of love, then I urge you to take a very close look at these Lemon Pepper Cauliflower Steaks. These decadent and impressive vegetable steaks are bold in flavor with an amazing melt-in-your-mouth texture that I think will make you fall in love. Cauliflower steaks are just as they sound. Delicious plant-based steaks made from oven roasting cauliflower. 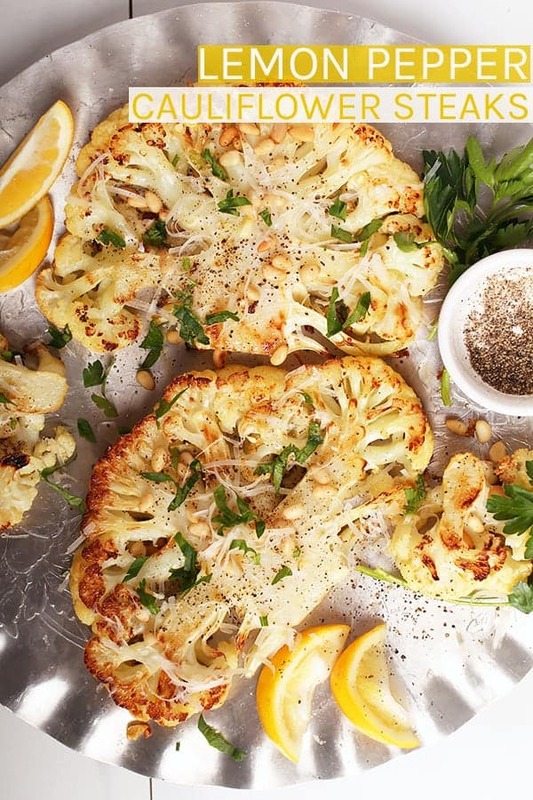 When roasted, cauliflower becomes buttery in flavor with a melt-in-your-mouth texture. So decadent! On top of that, cauliflower is the perfect canvas for flavor. Cauliflower Steaks can be made with spice rubs, a variety of sauces, or simple citrus and herbs. Regardless of how it’s seasoned, cauliflower steaks make a delicious and impressive plant-based meal for any occasion. As you already know, I’m a HUGE fan of Violife parmesan. This is not sponsored content, I just absolutely love this cheese and their parmesan makes this recipe so much better. I first discovered Violife when traveling around England and, friends, it was the BEST vegan cheese I had ever had. It is creamy, melty, and tastes exactly how I remember parmesan to taste. I find their cheeses at Whole Foods but you can also check out this map to find Violife near you. 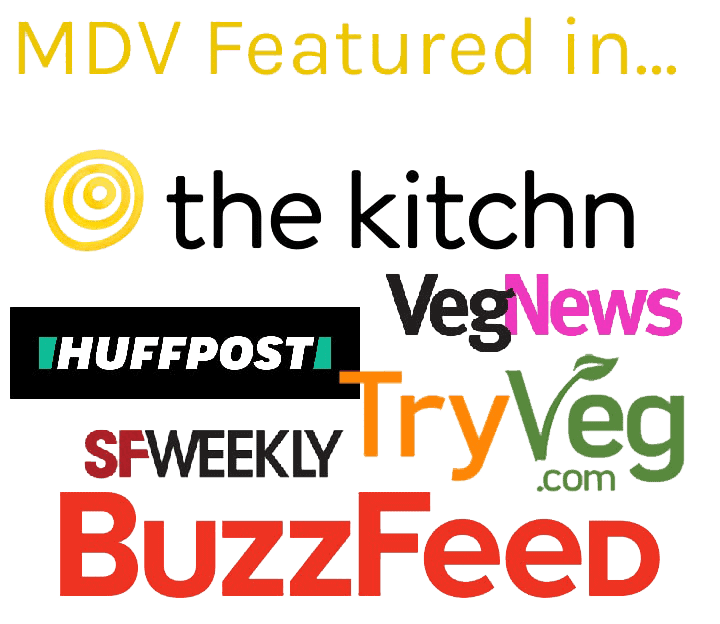 If you don’t have access to Violife, you can make your own parmesan or omit it altogether. 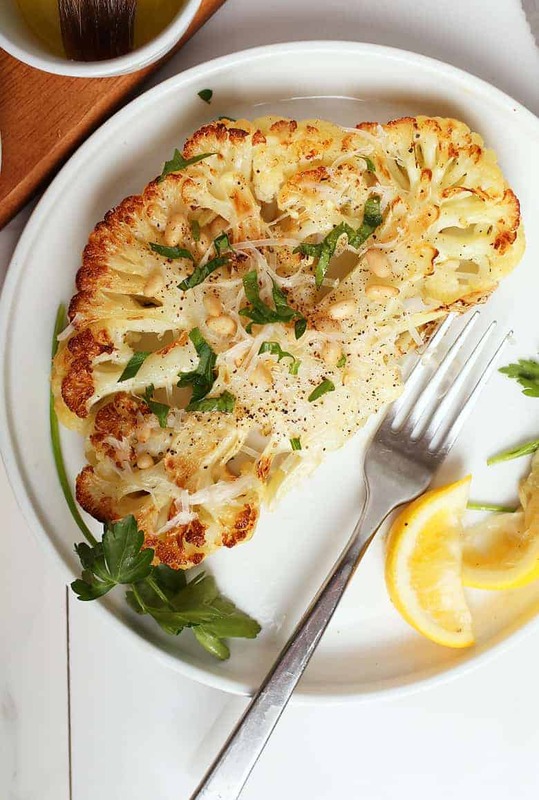 Roasted Cauliflower Steaks are an extremely decadent entrée but fortunately for all of us, they aren’t that hard to make. Not much different than roasting vegetables, even beginner cooks can make this delightfully impressive meal. Let’s look at this step by step. Step one – Cut the cauliflower. First, remove all the leaves and trim the stem end. Next, hold the cauliflower with its base on the cutting board. With a sharp knife cut right through the center of the cauliflower so that you have two even halves. Finally, take each half and cut a steak that is 1″ wide. You will end up with two or three 1″ steaks. The remaining ends of the cauliflower can be roasted along with the steak or saved for other cauliflower recipes. 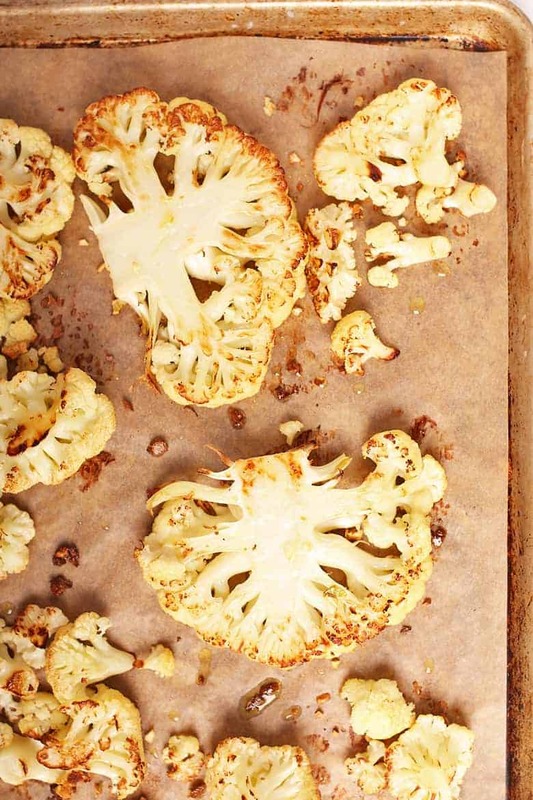 Lay the cauliflower flat on a parchment-lined baking sheet. If you are using all the cauliflower, you can lay the end pieces alongside the steak slices. With a pastry brush, generously brush each steak with oil. Sprinkle with minced garlic and bake for 30 minutes. After 30 minutes, remove the pan from the oven and gently flip the cauliflower over. Brush the underside with oil and return to the oven for 10-15 minutes until the cauliflower is tender and brown along the edges. Once the cauliflower is out of the oven, it’s time to flavor it. If you are using vegan parmesan, immediately grate it over the warm cauliflower so that it begins to melt into the steaks. 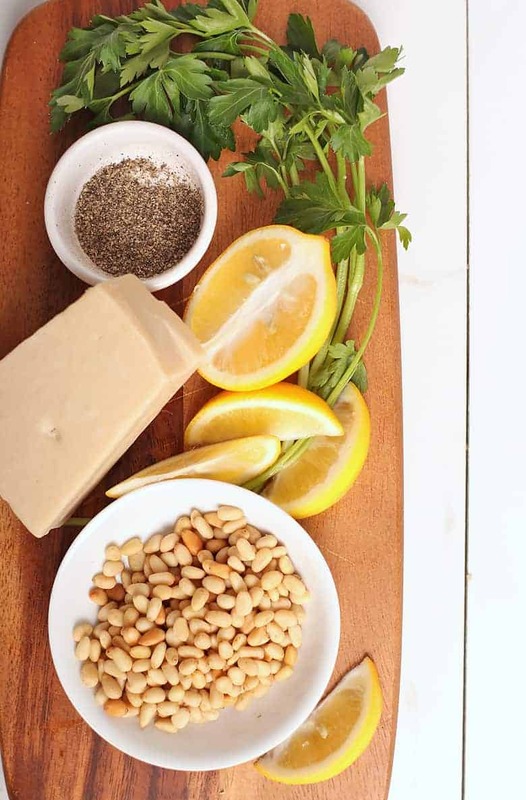 Squeeze the lemon over the steaks then add the freshly grated pepper, toasted pine nuts, and fresh parsley. That’s it! Now it’s time to serve. Roast your cauliflower at hot oven temperature. This will give you the nice brown crust on the edge with the buttery inside. Be generous with your oil. Fully coat the cauliflower on each side. Also, be generous with your flavors. 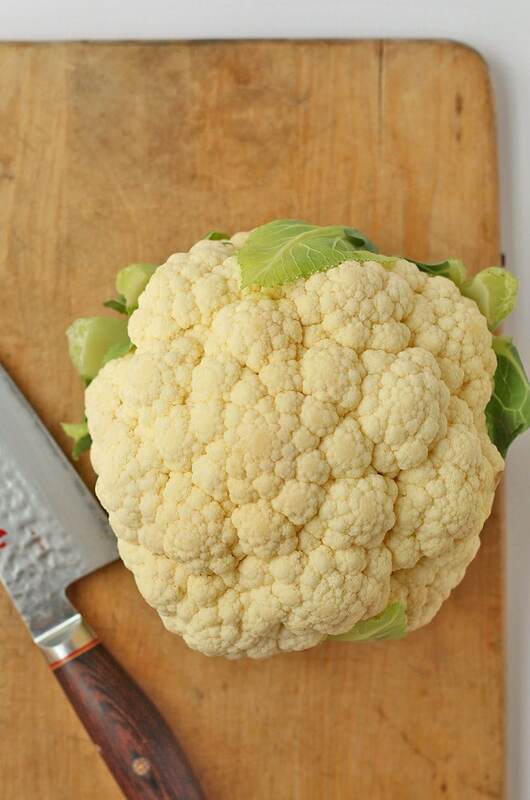 Cauliflower is an empty canvas and can handle a lot of bold flavors. Serve these cauliflower steaks alongside pasta or a big Caesar salad. These cauliflower steaks do not store well. They should be eaten within 30 minutes of roasting. 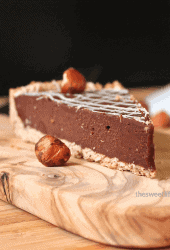 And that’s everything you need to have the most delicious and romantic vegan Valentine’s Day. 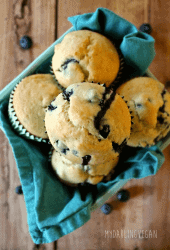 So, let’s get started by taking a look at the recipe card below! Destem the cauliflower, remove all the leaves and discard. Holding the cauliflower with its base on the cutting board, cut right through the center of the cauliflower so that you have two even halves. Take each half and cut a steak that is 1" wide. You will end up with two 1" steaks. The remaining ends of the cauliflower can be roasted along with the steak or saved for other cauliflower recipes. 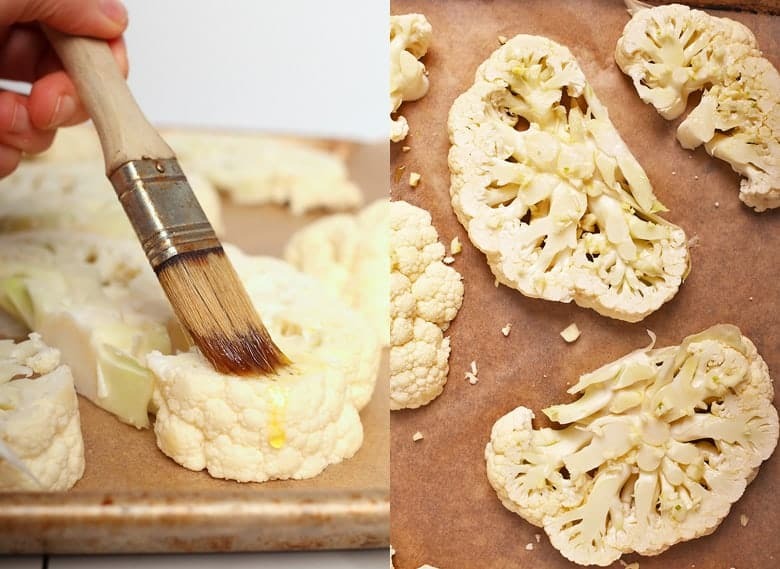 Place the cauliflower on the baking sheet and generously brush with oil. Sprinkle with garlic and bake for 30 minutes. After 30 minutes, flip the steaks and brush the underside with oil. Return to the oven and bake an additional 10-15 minutes until steaks are tender and the edges are brown. 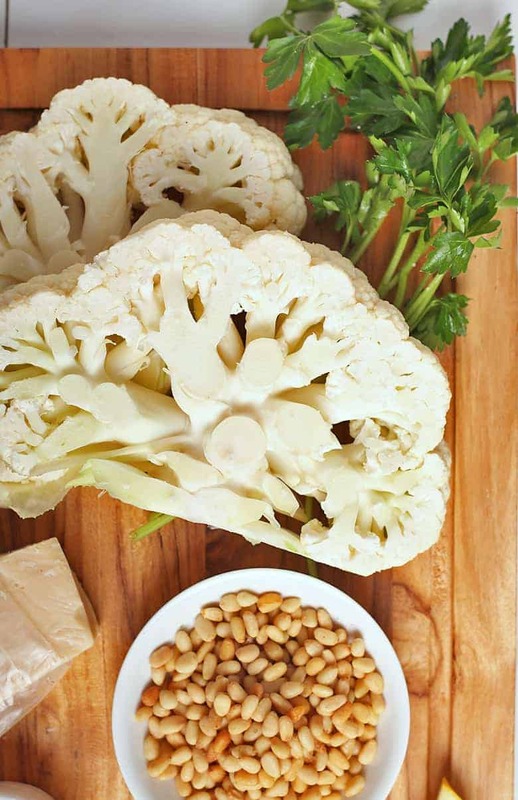 While cauliflower steaks are baking, gently dry-toast the pine nuts over the stovetop. This takes about 3-4 minutes, shaking constant. Remove from heat and set aside. Remove from oven. Immediately shred vegan parmesan (if using) over the warm steaks to allow it to melt. Evenly squeeze the lemon juice over the two steaks and freshly ground pepper. 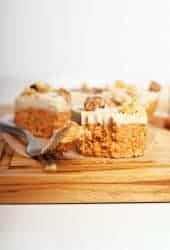 Top with pine nuts and parsley and serve with pasta or a large caesar salad. If you are roasting all the pieces of cauliflower along with the steaks, you may need to increase the amounts of the remaining ingredients for bold flavors. This looks wonderful! I will be making this tonight for my valentine. 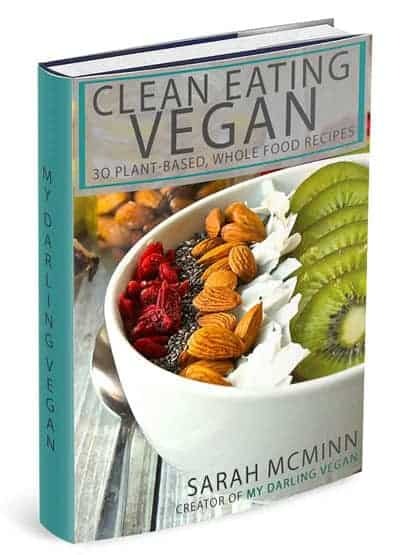 Thanks My Darling Vegan!